In light of my preparation for the Traditional Latin Mass and in light of Resurgent in the Midst of Crisis, my attitude toward concelebration has shifted. Any Ordinary Form Mass with a bishop as celebrant is an appropriate time for concelebration because of the unique theological relationship priests have with their bishops. In addition, in parishes with more than one priest, the Evening Mass of the Lord’s Supper, the Easter Vigil, primary Mass on Christmas, parish feast day, etc. could be concelebrated. Also for funerals. But not as a matter of course, like the daily community Mass in a monastery or seminary. What I am now moved to explore is the phenomenon of the non-celebrant priest present at Mass. Since with the priesthood of the baptized, every baptized person present at Mass offers, in a way, the sacrifice of Christ on the Cross as well as the sacrifice of oneself with Christ to the Father, does concelebration make any difference for ordained priests who are present at Masses they are not offering as celebrants? To rephrase the question, does a priest concelebrating at a Mass in the Ordinary Form exercise a higher level of efficacy or enjoy a greater access to sacramental graces than a priest assisting at a Mass in either form in the pew, in choir, or serving (in the EF) as deacon, subdeacon, assistant priest, master of ceremonies, etc.? The question amounts to this: Does a priest who merely attends a Mass rather than celebrating it participate in a qualitatively different way than a layman does? I answered along the following lines. 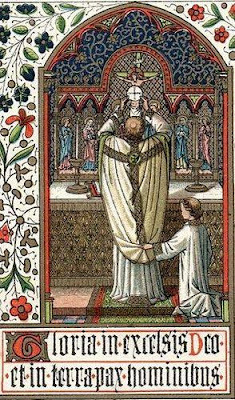 It seems to me true that a priest is called to the altar of God every day, if possible, to represent and act on behalf of Christ the High Priest, and to offer the holy sacrifice for himself and for the people. Obviously, concelebration is not wrong in itself, and there are times when it seems to be called for, but to make it into a general or normative practice is certainly a deviation from the organic development of the Roman Church, and I am glad that so many are rethinking it and rediscovering how a priest may fruitfully pray “in choir” (though not in substitution for his daily Mass). Concelebration is an exercise of the ministerial priesthood in a way that praying “in choir” is not, since the latter participation in the sacrifice is not essentially different from the way in which a layman participates—namely, by uniting himself spiritually with the priest who is actually offering at the altar, and in that way, uniting himself with Christ. The priest is ordained to offer sacrifice in persona Christi, but when he assists at Mass not as the offerer, he is not exercising this specific power, which is manifested and actualized in the consecration. Serving as a deacon, on the other hand, is a distinctive way of participating in the liturgy which can neither simply be reduced to a layman’s participation nor made equivalent to a priest’s. The subdeacon presents a special case, because a layman can, in a pinch, serve as a “straw” subdeacon, and also because the status of the subdiaconate is somewhat perplexing in these days when we are suspended between the OF world (where the ministry no longer exists) and the EF world (where it definitely exists). It is one among many questions for which a future solution will need to be found. The priest offering Mass (whether celebrating or concelebrating) is doing something unique, to which no other ministry can compare. The priest assisting at Mass as a deacon or subdeacon, or the deacon or subdeacon in their respective capacities, is participating in a manner subordinate to that of the priest but still with an exercise of major or minor orders that is distinctive to him and in which the laity do not share. The priest assisting at Mass “in choro” is participating in the Mass as the laity do, but with external marks of honor, such as cassock, surplice, and stole, to convey his difference in identity and his proper place in the hierarchical communion of the Church. That is what I feel able to say, but it is a question with many interesting ramifications and implications to it. I would certainly value comments from any readers who have light to shed or further speculations on any aspect of the matter. For more on the entirely non-Roman novelty of modern concelebration, see here; for more on how it differs from the Byzantine practice to which it is erroneously compared, see here; for more on its spiritual disadvantages, see here. Contrary to some reports, there is no definitive judgment from the PCED that the long-standing custom of the “straw subdeacon” may never be followed. It happens regularly in Ecclesia Dei communities and shows no signs of abating. It could have been officially stopped if that was thought to be necessary or important.